Really excited to share that you can now find my pieces on display and available for purchase at Mubarakville! 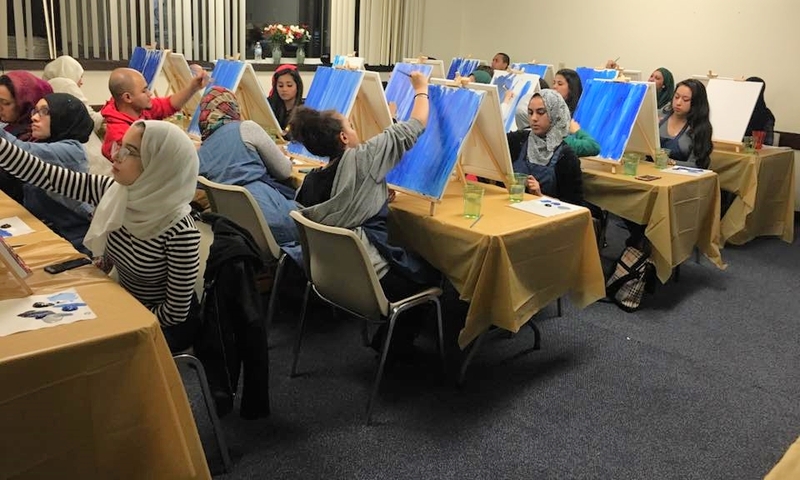 Salaam: My First Paint Night! 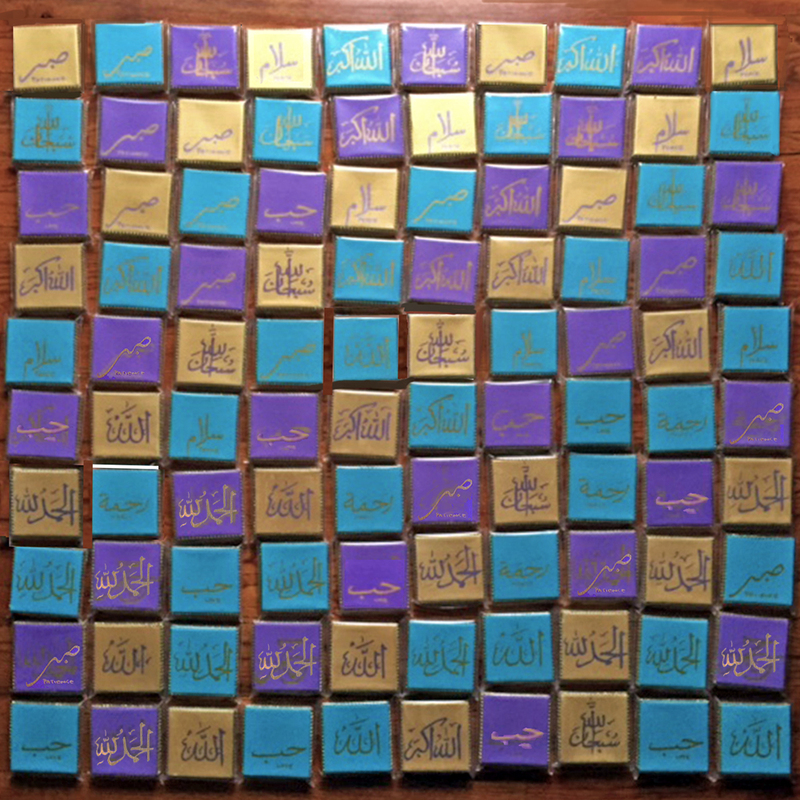 These were wedding favors for a beautiful Walima, themed in lilac, light blue, and gold. I picked phrases reflecting love and gratitude. Unlike many others who see from the outside in, artists see things from the inside out. Having that emotional connection with eachother, our surrounding, our inner-self, is what gives our work its true meaning. In conversation with Mohsin Hamid, he spoke eloquently about his recent work Discontent and its Civilizations, shedding light onto his perception on life. He read an excerpt from his book talking about how there is an underlying hypocrisy within our civilization today, where to speak freely, it's as if every word must be monitored. It's to understand that freedom exists alongside tyranny. I thought it was so beautiful as he described the sentiment of love when talking about the relationship of his daughter to his father, her grandfather. He said, how love must be a selfless thing, yet often people get lost in the illusion of love, craving what the self wants, wanting what the self thinks it needs. That form of "love" is utterly selfish; it is only a form of pleasing oneself. Mohsin Hamid spoke about how his father is always so excited for the future that lies ahead, which really isn't for himself - it is excitement for the days that lie ahead for his 5-year old granddaughter. Her future, her life excites him and that's what love is - a beautiful thing, the epitome of being selfless, to please not yourself, but the one you love. The self becomes so focused on that positive energy, on loving the other, and loses oneself in it. Whether that love is an attachment to a tangible thing, a person, or for God, to truly love was never for your sake. What you do gain from it is a sense of sakoon (serenity), and that's when you know it is love... the right kind of love. 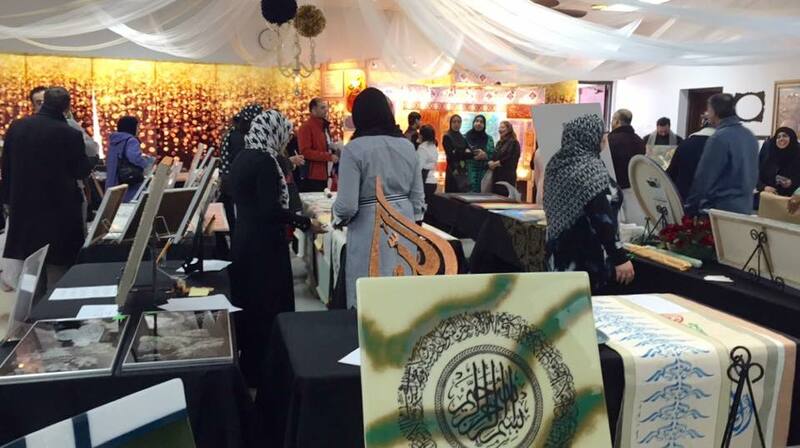 MashaAllah, a wonderful art expo put together by ISCJ with a great turnout and an eclectic mix of artwork! 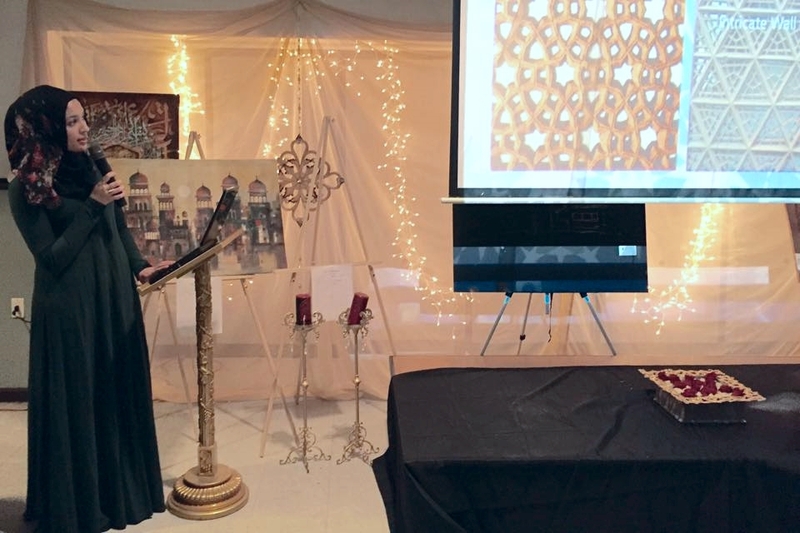 I particularly loved seeing the art demonstration on the #OurThreeWinners by Faraz Khan and modern glass-blown art pieces by Saadia Abbasi, hearing the journey as an artist by Asma Shikoh, and enjoyed giving my presentation on The Beauty of Islamic Architecture and Geometric Design. Missed the event? Want to donate to ISCJ's Expansion Project project? Please click on the button below! What you hold in your heart is what life will give you- some will receive it in the form of a gift while others a test. Whichever it may be, you were chosen to fulfill a purpose. Know, that you will never be tested more than you can handle and never rewarded more than you can be grateful for. If one of those is out of line, know it is temporary and that good, that bad, will be gone in a matter of time. That time is your test. What you hold in your heart will be a reflection of your actions, of yourself. Fill your heart with the pearls of virtue and integrity and never sell it for the worthlessness of hypocrisy. And if that thorn of hypocrisy may live within you, prick it out before it embeds itself within you permanently. And if those pearls lay firmly in your treasure chest, bound tightly and engraved in the walls of your heart, treasure them for eternity for its value will never lessen and its beauty will never fade. Keep it in the safest of your treasures, deep beneath everything of worldly pleasure and worldly dangers. First day of the London Study Tour, we met with U.K’s chief planner, who discussed the role of the Department for Communities and Local Government in England. He shared with us planning principles in the U.K., following a plan-led system. I found it intriguing that 90% of planning decisions made by officials do not actually go to court; the role of the government is to legislate, guide, and govern policies, whereas the local level is essentially responsible for plan-making and decision-making. To give us a better perspective on the way the cities are governed, Steve and Mick shared with us case studies discussing the local planning vs. neighborhood planning processes. Getting to the depths of among the two of the most important surahs in the Quran, Surah Yasin and Surah Ar-Rahman, has had a significant impact on my life. Both have brought a positive change by understanding the words, the meanings, and the stories behind the verses-- subhanAllah, each so beautifully placed. Racing back through the highlights, one message was so powerfully engraved: the Qadar of Allah. Design professionals encompass a range of expertise and fields, from architects and engineers to planners and surveyors. What is particularly interesting is how these professionals handle an element as static as liability, in comparison to the fluidity present in the conceptual design realm. Evaluating general or construction liability under which a design professional is bound to legal text is a difficult task. Liability encompasses not only legal responsibilities, but also negligence in adhering to those responsibilities. Yet, in order to practice lawfully, every design professional must meet a standard level of care in their work and their actions. With measures taking the root of liability, its consequences, and preventive measures into account and meticulously placing it in one’s routine, design professionals can avoid liabilities to a great extent. Just when you thought you had some control, some right on the life you live, well, guess again. There’s a lot less that’s in our hands. As I sit here and write about a particular brave young girl in mind, I can’t help but think about the 20 other children in heaven and quite honestly, what these children, living worlds apart, share in common. Education. And not only education for a place of learning, but really, a zone of danger. Malala Yousafzai is a brave young-girl, commended by many for putting her own, her family’s life at risk for the principles she stands by, for the rights she fights for. She is a bright young individual, and certainly a brave soldier as well. She is one to stand up to those that are day by day, drowning education in blood. Whether it is one of Malala to be a spokesperson for her classmates and herself, fighting for their rights to be able to learn or these innocent children in the States, who were living the most ordinary “perfect” lives, little did we know that tragedy would strike. It’s so unfortunate that an institution of learning is what bridges these children-- why has education become a connotation for violence today? Why are children’s lives at risk today in a place where they are supposed to be the happiest, the safest? Why is society, instead of progressing and moving forward, taking leaps backwards where our concerns are the safety of our children? Why are we today still questioning the right to a child’s future? Take a moment to stop and think about the kind of world we live in today, and then take another to think about what you would do to change it... to set it back on track where parents have confidence sending their children to school. Where parents have faith in their children’s futures even after they are gone. as it befalls on all of eternity like the calm after the storm? Sitting on the express comfy Daewoo bus from Lahore to Multan to Islamabad, I saw from my window the small villages, big green plantations, mud houses, men having chai sitting on handmade woven wooden-cloth beds as the bus rode on the bumpy dirt roads. Although sitting in it for nearly 8 hours made me car-sick, I enjoyed the scenery at some parts and of course, chit chatting with my Aunt :) I always like to think I am Pakistani at heart, whether this means blurting out Urdu phrases with some of my close friends or with the “Pakistani” values I hold dear to my heart from my parents :) Traveling through Pakistan, walking on its streets observing the people around me, I realized there was a lot I had tucked away in the back of my mind. She stood in the corner hiding behind her sisters and watched closely as I carefully pinned my hijab in place. I could see curiosity written all over her face reflecting from the mirror I stood in front of fixing my self. As I peeked over, she would smile shyly and look away-- especially in front of me, she was really shy all the time. Whenever she mustered up the guts, she would ask to hold my SLR camera on our way out or drop a sweet innocent compliment as to how I looked Pakistani-ed out :) That’s my sweet 5-year old cousin Rania. Seeing Dubai, oh the excitement. So officially on vacation mode, gearing up to spend the last few days of Ramadan and going sightseeing in one of the places I have longed to go see for as long as I can remember. However, let’s not forget that one thing is for sure--things are meant to be. Architect + City Planner by profession. Islamic Art & Design Enthusiast.